absolutely great job on this item. It was a great size. you helped me remember my loving baby . Nice way to remember my ?? kitty! Great way to remember my 4-legged child!! I would buy this product again in a heartbeat. My bestfriend Westie died. She had him for 15 years. She has a beautiful flower garden in her back yard. I bought this so that she would have a memorial . When I gave her the stone, of course we both cried. But the bright side to this is that when mother passed; someone gave here a stone for her. Now they both have a stone. It is perfect. Lost him to cancer last July. Couldn't ask for anything better, it is just super. Used them for my beloved deceased pets. What a wonderful way to honor my Beloved kitty! I had it made for my neighbor and she was so delighted. It really uplifted her spiriis. I am very pleased with this product and it was a great memorial to my little dog that I recently lost. I would buy this product again ! Very nice memorial stone! This pet was 15 years old. There's another one that is not doing so well and he is 18 years old. I will definitely buy another one and recommend this to others. Very nice! In my flower bed and it was perfect just like my fur babies were! Everything was perfect, the two people that I purchased these for were very happy with the product. Love it, such a good memory of my fur baby. I ordered this for a dog that passed last year and like how it looks in our garden. I have a memorial garden for all my pets that have gone to heaven. I was so pleased with this stone that I ordered another one for another pet whose stone broke. It is so touching to look at the memorial garden and remember all our precious pets who have touched our hearts. I would recommended to everyone who lost a pet! This was prefect for my girlfriend's front yard! We lost our longtime family friend King in a tragic way. So I wanted to do something special to keep his memory alive. Product was as pictured & more beautiful in person. 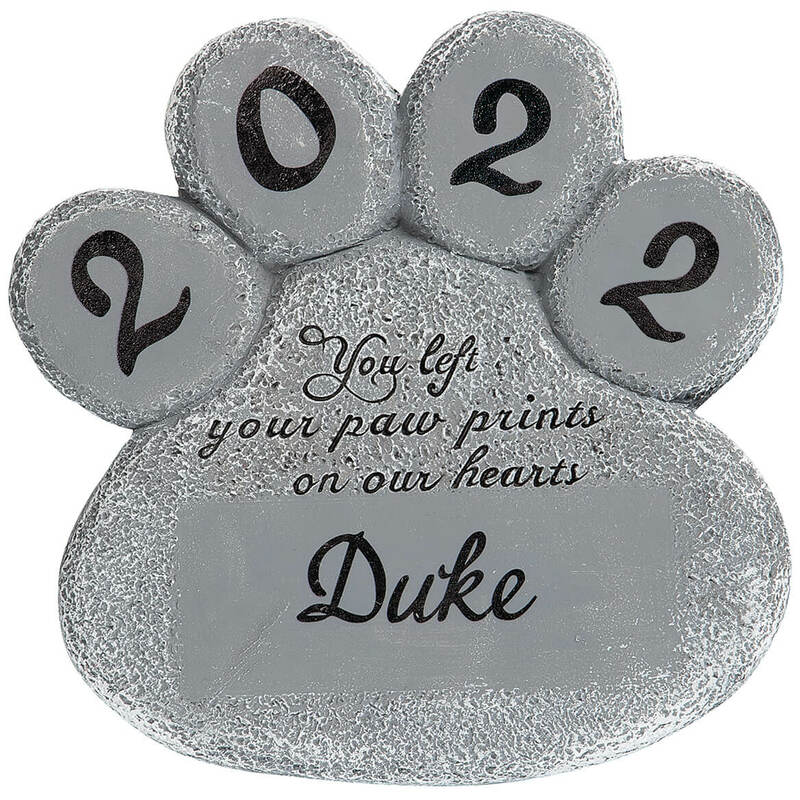 We were very pleased when we opened the package, the stone was so befitting for the loss of our fur baby. Looked so beautiful & the verse was perfect! This stone is now in our pet cemetery. It came very well packaged. Arrived in one piece. Beautiful decal, no scratches or imperfections. Met all of my expectations and the price was right too. Gave as a gift for friend who lost his dog. He loved it and was touched. I think all the exact charges over the product actual price were a bit excessive. I gave it as a gift and they loved it. So much more beautiful than the pictures. It's big and beautiful. I bought a memorial stone from you 10 years ago when we put our golden retriever down and now I bought one again from you for our yellow lab. I have them in our rock garden on my patio so every time I come home I can see them. This is a good size and we loved it. Gotta order again my mom accidentally broke it she clumsy. I put it in my flower bed with my dogs cross a little memorial for him have three of them. I looked around at a lot of different ones and this one was the best of me. Yes i would these are nice cat memorials i bought three and they remind of my pasted away cats. We were very happy with our "Abbey's" marker We laid it on her Grave(Yorkie) We Sprayed waterproof Spray on it to save on the weather conditions. If you had a color choice I would have liked a pink color marker for her grave site.It was nicely made & happy with the Stone. Very impressed with the quality and details. My friend lost her dog and was very upset. She received this and said it made her day. A great way to remember him. She is going to place it under his favorite tree and spot he loved to lay in. Our beloved Simon Passed away in August. This is going to be his "headstone!" When the season changes and we get our yard ready we will have a wonderful spot as a memorial for our sweet boy! This was for a pet memorial. I have all my memorial stones mounted on my fence with a small flower garden; to remember my precious fur babies. 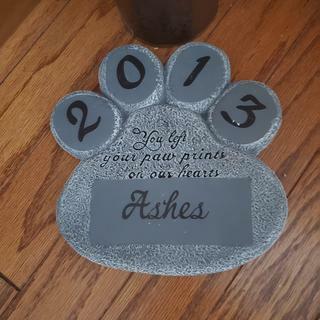 Awesome way to remember your best fur baby. Thank you for the perfect Memorial stone. I thought I was going to get it with the name all together because that is what it said when I ordered it. You made it perfectly! This was for our Radar & Edy. Thank you! We love it! Love my Pet Stone. I used a large river rock as a headstone and have the Pet Stone leaning against it. Would be nice if a hanger was fasten to the back for those that would like to hang it on a wall. Very well pleased with the marker for our pet Lucy. Just tore my heart out when my pup passed after trying to keep her alive, hospitalizations, tube feeding, sleeping on the floor with her. I finally had to give up and let her go. We built a little casket and burial spot, but this memorial stone made it more personal and loving than anything. Thank you. It is such a comfort when I walk out the back door and see her name. We also included solar lights for night. This product was perfect! I had ordered 2 and they were a wonderful surprise. This was bought and shipped directly to my mother in law, but I have to say she was truly brought to tears when she opened it. She lost her pup to a reckless driver a month or so ago and we wanted to do something special for her. Words can't describe how she felt about the heartwarming gift. I put this in my flower bed in memory of my pets, it looks beautiful and it's nice to remember my pets.I purchased three of them with my pets name on them. I have various pet memorials for our dogs - the others are resin with a place for the pet's picture. They weren't personalized but had a brief verse on them. I used paint and stencils and added the pet's YOB and YOD. plus their names. On this one I could only add the YOD and had it personalized with her name. It's attractive and will be an okay addition to our "pet memorials" in the yard. I wasn't sure if the year and pet's name would stay so i sprayed urethane paint on it and will wait to see how long it lasts. To honor pet that has passed. I love the verse and the size of the memorial. I had 2 dogs cross the 🌈 🌉 in the last 2 months. These stones will look beautiful on my stone patio. My dog recently passed away. I thought this would be a good way to honor her. She was an awesome dog!! Family just lost a pet. My mother lost her 16 yr old jack Russell and had no stone for her. because I liked it and my grandson wants one too. It was fitting for the occasion. I chose this because it could be personalized. My dog's name was JAWs, uppercase JAW, lower case s. Important that it be right. Very Sentimental in Memory of my favorite cat. 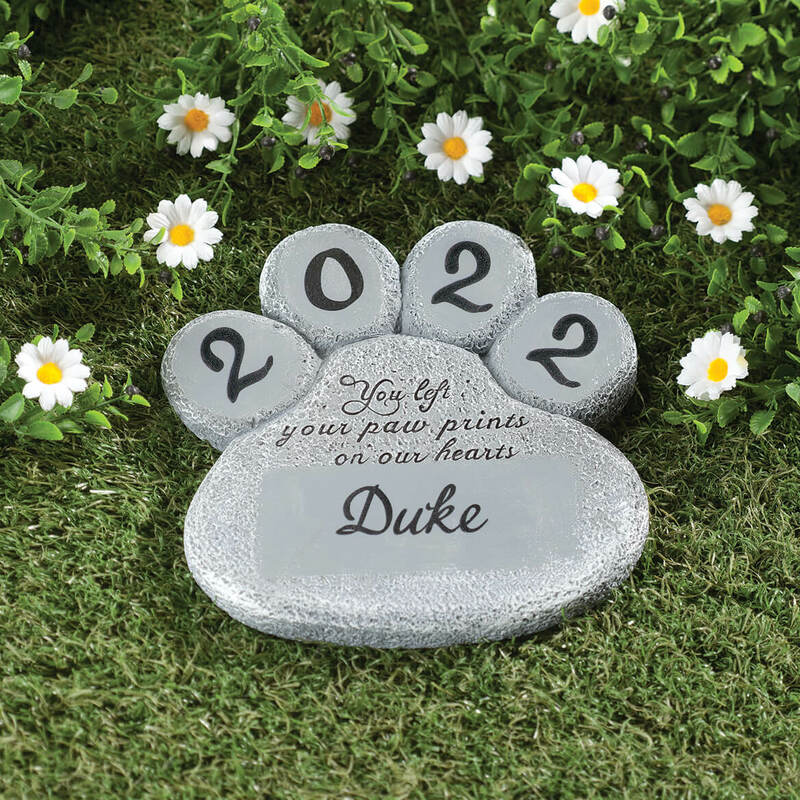 I have order pet memorial stones for other dogs. The are beautiful markers. Our daughters dog passed away earlier this year & wanted a marker for her. Loved the saying on the marker. I lost my girl Jazmine in 2014. I've wanted to put a stone memorial in my yard ever since to honor the faithful friend she was for 7 years. My friend lost her beloved dog this week and I wanted to do something special for her. I lost 3 dogs within a year. This was just the right thing to put on their graves. The memorial stones will be weatherproof and I don't have to put a picture on them. The saying on it is perfect. I have been looking for something like this since the loss of our dog. However, if I keep it outside, I will seal it first. My favorite pet pass away a few years ago and I always wanted place something where he is buried. Now I have the opportunity. Beautiful way to place on her little grave. Thank U! The best selection for my needs. I thought it would be a good remembrance and would fit nicely in a garden. Purchased 1 prior. We can have cold wet windy winters and it holds up well to the elements. I purchased this for my daughter and son-in-law who had to put their 18 year old cat down a few weeks ago, he was part of their family and loved very much. This plaque is a sweet reminder of their time with him. I needed to replace the headstone of one of my deceased pets. And order another one that passed away this year. This is the second memorial stone I have bought. I love it! It is a beautiful tribute to a pet that has passed away! I just love them & in the shape of a paw is perfect! BEST ANSWER: Thank you for your question. Weight can not be personalized on it. It can only be with one year and the pets name. We hope this information will be of help to you. Is it concrete or plastic? BEST ANSWER: Thank you for your question. The stone is made from 100% concrete. We hope this information will be of help to you. How fast can you have it delivered? BEST ANSWER: Thank you for your question. The Memorial garden stone measures 8 1/2" long x 8 1/2" wide. We hope this information will be of help to you. What are the dimensions of the stone? BEST ANSWER: Thank you for your question. The stone is 8" x 8" x 1" thick. We hope this information will be of help to you. Are you able to put 2 dog names on the rock? BEST ANSWER: Thank you for your question. There is a limit of 1 line 9 letters/space. We hope this information will be of help to you.